The Boleslav team shot over Brno and it was a great match indeed. They won the first half thanks to two shots by Sedláček. Kalina scored the winning goal just before the end of the game. In the Gambrinus League table, sixth-place Boleslav had just one point more than Brno, which was in ninth place, thus indicating a keen battle. Each team had to face difficulties due to several absent players. The Boleslav team arrived in Brno without Janíček (injured) and Sylvestre (cards). The Brno side lacked Trousil, Dřížďala, Husár and Hodek, all of them injured. On the Brno grass, the two tallest defenders in the Gambrinus League met to fight. They were Adrian Rolko from Boleslav (202 cm) and Huška from Brno (200 cm), which made the local speaker extremely happy. The match began by a push from both sides. After the first fifteen minutes the score in corner kicks was 5:5. The goals came later. In the 25th minute, Kulič and Sedláček showed their mastery. The Boleslav captain overran the Brno defenders on the right wing and had enough time to plan where to centre the ball. He overlooked Táborský, who was approaching the goal area and chose the unattended Sedláček at the border of the sixteen-metre area. Slowly, he took Kulič's pass and directed the ball with his left foot just to the left post of the Brno goal, which at that moment was inaccessible to Bureš - 0:1. Just a second after that, Kulič hit the pole with the penalty kick. In the 34th minute, after a series of minor errors on the side of the Boleslav defenders, Kalabiška used his chance to get the ball, exchanged it with Rabušic and sent it along the ground, past the running out Šeda - 1:1. It was less than five minutes and the Boleslav team won the lead again. At the curve in front of the Brno sixteen-metre line, Dvorník pulled a foul against Zahustel, and Táborský, Kulič and Sedláček were nominated for the penalty kick. First, Táborský argued about the distance of the players' wall and got the yellow card. Then Sedláček used his magic left foot and hit the left upper corner after the ball just slightly touched the post - 1:2. In the second half, it was an offensive game again, with dramatic situations in front of each goal. In the 59th minute, the Brno players attacked again. On the right side, Kalabiška sprinted, passing the ball to Rabušic, who then headed the ball into the net - 2:2. In the 82nd minute, after confusion in the Boleslav penalty area, during the rough combat the goalkeeper Šeda missed the ball, which - in front of the empty goal and very close to the active Dvornik - was caught at the very last moment and headed off by Kalina. At any rate, the last word came from Boleslav. 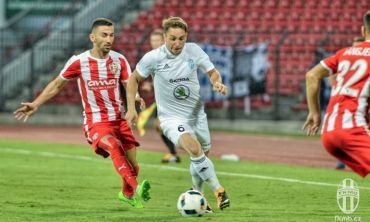 In the 84th minute, Chramosta transferred the attack from the left to the right side of the pitch and, through a perfect action, he gave the chance to Kalina. He, in a full run, overcame Bureš - 2:3. Thus the Boleslav team used the advantage of power play when, two minutes before the winning goal, Dostálek from Brno had to leave the pitch after his second yellow card. He was sent off because of his attack against Chramosta. Towards the end, it was a keen match again as Zahustel was kicked by an opponent and limped until the last second. FK Mladá Boleslav team: Šeda - Kalina, Procházka, Rolko, Hrdlička - Zahustel, Mendy (Opiela 79), Kúdela, Sedláček (Poláček 67) - Kulič, Táborský (Chramosta 58). Goals: 34. Kalabiška, Rabušic 59 - Michal Sedláček 25 and 38, Kalina 86.